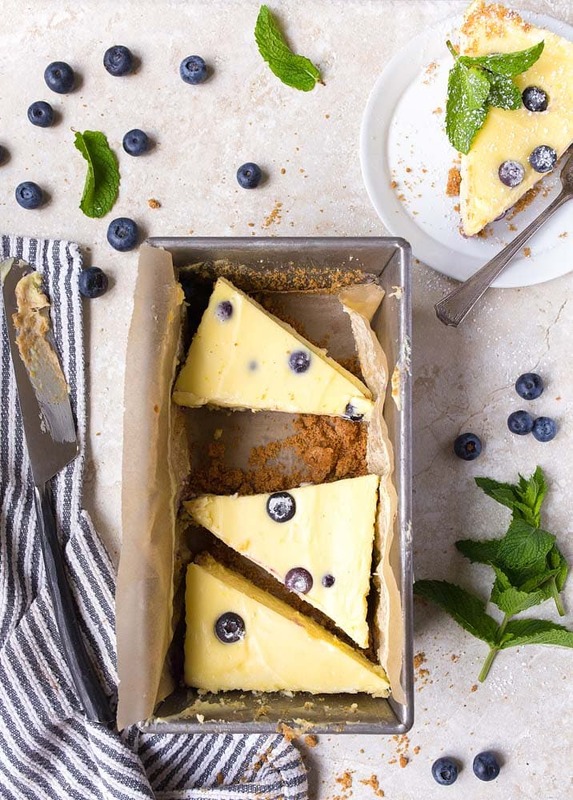 Lemon blueberry cheesecake for two, baked in a bread loaf pan for a small serving size. Look, there’s a lot going on in this world. And I just want to talk about the berries. Mainly, the blueberries. They’re amazing this year. It’s almost making up for the fact that the strawberries are not what they should be (not that it stopped me from putting them in this strawberry cake for two, a small batch strawberry jam , or this strawberry pretzel parfait). And don’t even get me started on the disappointment that is cherries this year. Thanks for letting me be someone in your life that complains about fruit. When there are bigger problems in the world. Pass the fork, right? I like to think you and I can escape into dessert together. That we can make a mini cheesecake for two and feel good. And give away the other four mini slices and make four other people feel good, too. Of all the things I’ve scaled down, this cheesecake for two is one of my favorites. It’s not just convenient to use a bread loaf pan (<–affiliate link to the *exact* pan I use) to make five mini slices instead of a giant labor-intensive cheesecake, but it’s also incredible. It doesn’t crack. It doesn’t sink. It just IS. It exists and holds its shape as a cheesecake should. When you slide your fork into it, it’s somehow still light and fluffy. Someone told me in Chicago that they abandoned their family’s recipe for cheesecake when they tasted this cheesecake for two. (And I was like ‘sorry, Grandma!’). I’m starting to realize from my Facebook page that you guys are mainly looking for small-batch dessert recipes for portion control more than a romantic date night dessert. And that’s amazing. I love that you want to eat dessert every day of the week without tempting leftovers on the counter. So, even though this lemon blueberry cheesecake makes five slices, I want you to know how to freeze the extra slices: slice the entire cheesecake, cover the top and sides with a piece of parchment or wax paper, and then wrap in plastic wrap, place in a container and freeze. The only problem is that being frozen still won’t stop you from eating them. Not that I know from experience. (I definitely know from experience). You can absolutely cram more blueberries into this cheesecake than 1/3 cup. You can press extras into the surface, too. I love that the low baking temperate of this cheesecake keeps them mostly whole, instead of a soggy mess. Each blueberry becomes a bite of jam in the oven. And it’s exactly as delicious as it sounds. Lemon blueberry cheesecake for two. Lemon blueberry cheesecake for two, made in a bread loaf pan. Lower an oven rack to the lower third position and preheat oven to 325°F. Line a 9x5 inch loaf pan with parchment paper with enough overhang on the sides to easily remove the cheesecake from the pan. Set aside. In the bowl of a food processor (or a plastic bag), crush the graham crackers into crumbs. Stir the melted butter and granulated sugar into the graham crumbs. Push the crush firmly into the prepared pan. Bake for 20-22 minutes, until crisp and beginning to turn light brown. Meanwhile, beat together the room temperature cream cheese, sugar, egg, and lemon zest until very creamy, about 1 minute. Next, stir in the lemon juice. In a small bowl, stir together the blueberries with the flour, just to coat. Stir the blueberries gently into the cheesecake batter. Spread the batter over the cooked crust, lower the oven to 300, and bake for 40-45 minutes, until the cheesecake is set. The top will not be sticky. Remove the cheesecake from the oven, and let cool completely. Chill in the fridge for at least 6 hours before slicing and serving with a dusting of powdered sugar. I like small serving recipes but they have to be international or they don’t work for me. I have no idea what a graham cracker is…can you offer a generic name? What is it? Hi Jannn! Sorry about this! Grahams are also called digestive biscuits. As for conversions, there are some great ones online. I would love to include weight and volume ingredients in the future. I…have…all the ingredients…just hanging out…and probably not nearly enough willpower to not make this! The only drawback is that there are still 3 servings of blueberry basil panna cotta hanging out in the fridge (another dessert that lends itself so well to portion control!). I just bought a huge container of blueberries at Costco. I think there will be enough for my small batch blueberry muffins and you cheese cake. Oh, happy day!!!!!!!!! 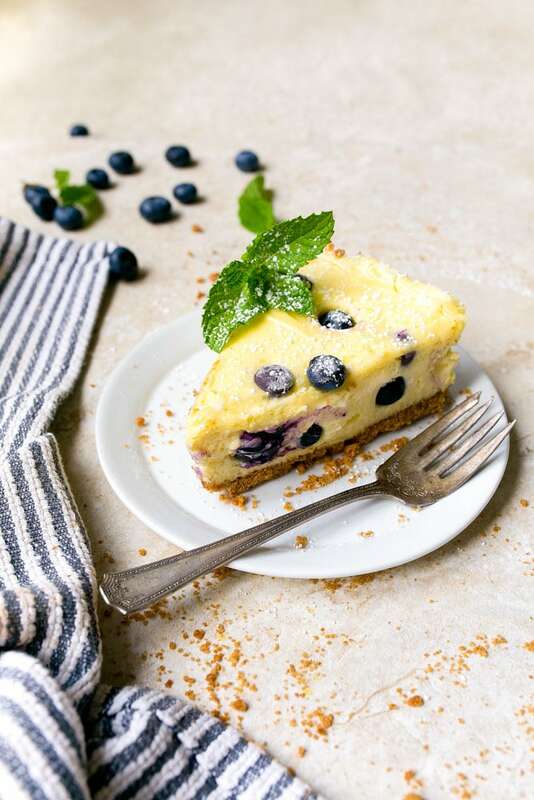 looks wonderful, blueberries AND lemon, and both in a cheesecake of course! Thank you for this recipe, and also for the serving tips and alternate portion control use, and yes why not freeze the leftovers, great idea! What is the measurement if you are using graham cracker crumbs? About 3/4 cup, I think? I have a steam oven and usually make cheesecakes in it to prevent the cracking that sometimes happens. This was my first attempt at a cheesecake or any of Christina’s recipes after seeing an article on her website in the St. Louis Post Dispatch. I made this for my girlfriend and me. She absolutely loved it! The only change I did was to double the blueberries. I am a pie maker normally, but will add this into my repertoire! I’ll just call it cheesepie! Hi! This is such a quick and easy recipe! Thank you for this gem! I have one question- my cheesecake looks beautifully baked, and I’m about ready to pop it into the fridge to be devoured tomorrow, but it smells a little eggy. Do you know why that could be? I baked it for 50 mins instead of 45 minutes (accidentally), so could that be the reason? I’m desperately hoping it tastes fine though! Oh gosh, I have no idea why it smells eggy. Does it taste eggy? Did you follow the recipe exactly? What a wonderful cheesecake!! I made it for my baby daughter’s 50th birthday yesterday and it really cheered her up! Me too. It’s such a surprise to wake up one morning and realize you are old enough to have your youngest turn 50. Uffda! But your cheesecake really made things a whole lot better. Quick question how much is 28 ounces…? Hi Steffi, it’s actually TWO 8-ounce packages of cream cheese. Two silver bricks, does that make sense? I love everything about this! 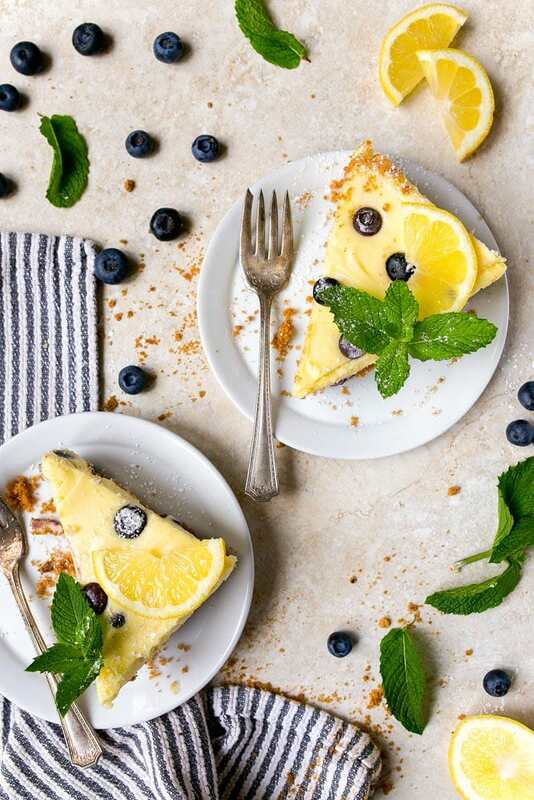 Lemon—-good, blueberry—-good, cheesecake—-good! Would this exact recipe work in a 6 inch springform pan? If not could you suggest how to modify? I would like to make this in a pie plate. Do you know if this would work and if I need to double the recipe? I’ve only tried it this way, I’m sorry! I would double it if you’re going to make it in a 9″ standard pie plate. I did make this and it is delicious. The link does not make it clear which loaf pan is correct. Can you give the dimensions please? BTW in my above questions I was referring to WF graham crackers. Honey maid are smaller and it seems obvious. Wow! This is a wonderful recipe! 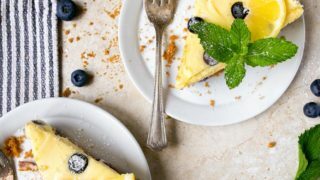 The freshness of the lemon and sweetness of the blueberries made this small cheesecake absolutely perfect. It assembled easily, baked just as instructed. A keeper for me! 2 8-ounce means – 16 ounces cream cheese right. Another delicious recipe. The lemon/vanilla flavors are wonderful together. I slightly overbooked it because Imade in a countertop oven and was not quite sure it was done, but it was still delicious.My husband does not like graham cracker crusts so I used Maria Crackers (by Goya). Makes a nice, non-soggy crust. Thank you for the recipe. I made this last night and it looked/smelled so good that we were unable to let it cool completely, let alone chill for the specified 6 hours in the fridge… HA! The other dessert-eating participant declared it to be the BEST cheesecake EVER. Yup, he even emphasized it just like that. I loved the subtle lemon flavor with the blueberry pops – next time I’ll add even more blueberries. Thank you Christina for yet another delicious recipe for my dessert rotation. How would I use this recipe to make a mocha cheesecake? I have a bottom crust.